Photo File – Story Time Part 2 | Achtung, Skyhawk! Having set the ball for long-winded photo commentaries rolling with my previous photo file, I am delighted to be able to continue the trend with what has proven to be an equally fruitful follow-on. True to my hopes and expectations for this year’s summer season, the material for Part 2 had flooded in rather quickly, thanks most of all to triple sightings of some pretty rare twins all in the space of two weeks. The emperor’s new clothes… first look at a new & improved 9A-DMG following an extensive interior and avionics refit – the latter of which lags little in sophistication behind today’s class cockpit 172SP (and quite a few bigger and more expensive machines as well). 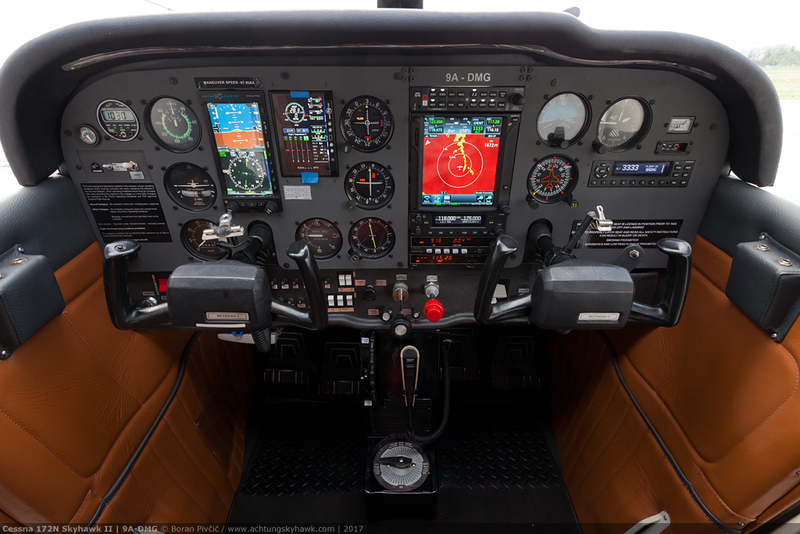 From left to right there’s the Aspen Avionics Evolution 1000 PFD (w/ Synthetic Vision System (SVS)), the JPI EDM 900 Engine Data Monitor (a fantastic piece of kit), Garmin GTN 750 touchscreen NAV 1/COM 1/GPS + Garmin GNC 255 NAV 2/COM 2… and bringing up the right the Garmin GTX 345 Mode S transponder. Not a bad look for an 1979-vintage “old man”! A bit of twin-engine action as this German canary navigates Lučko’s uneven apron on its way toward RWY 28. Even though the Seneca is one of history’s most popular piston twins, this early version – introduced in 1974 – is nowadays nevertheless a bit of a rarity. Created in response to the numerous criticisms levied at the original Seneca I – which was, with its normally-aspirated 200 HP engines, considered severely “asthmatic” – the Seneca II was fitted with turbochargers that, despite not adding to the power, had immediately and dramatically improved performance (especially in an engine-out scenario at altitude). 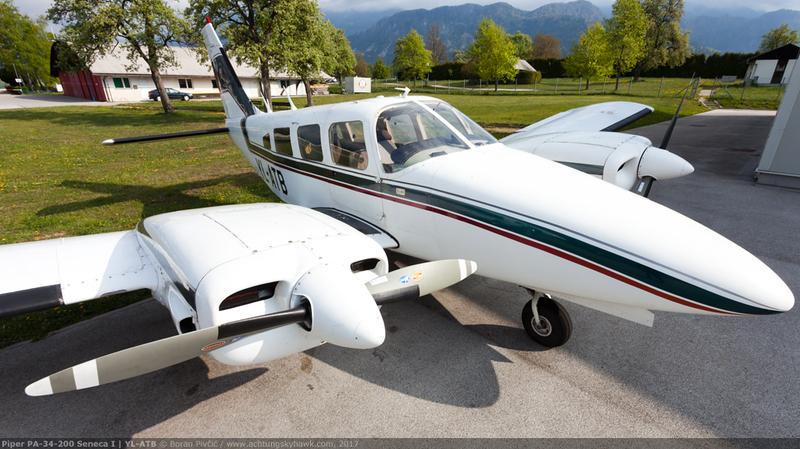 However, despite this, the type’s ultimate lack of power had remained a thorn in users’ eyes, leading Piper to add 20 HP per engine and new three-bladed props in 1981, creating the most popular PA-34 of them all, the Seneca III. D-GLOC itself had been manufactured in 1978, and had received its eye-catching paint scheme from its previous owner, Italian watchmaker Locman (which also explains the reg). On this day, it had popped into town to pick up a passenger bound for Split (LDSP) down on the Croatian coast. As soon as it got a bit of wind in its wings, the Falke had started flapping trying to get airborne… and why wouldn’t it: pleasant temperatures, a light wind perfect for soaring, and not a cloud in the sky! While far from the best design around, the type’s durability, simplicity and good all-round performance have consistently made it one of Europe’s most popular Touring Motor Gliders (TMGs) – a fact also helped by its capacity to accept almost any light engine available, from the two-cylinder two-stroke 26 HP Hirth F10A of the original SF-25A, to the turbocharged 115 HP Rotax 914F of the late-model SF-25C. 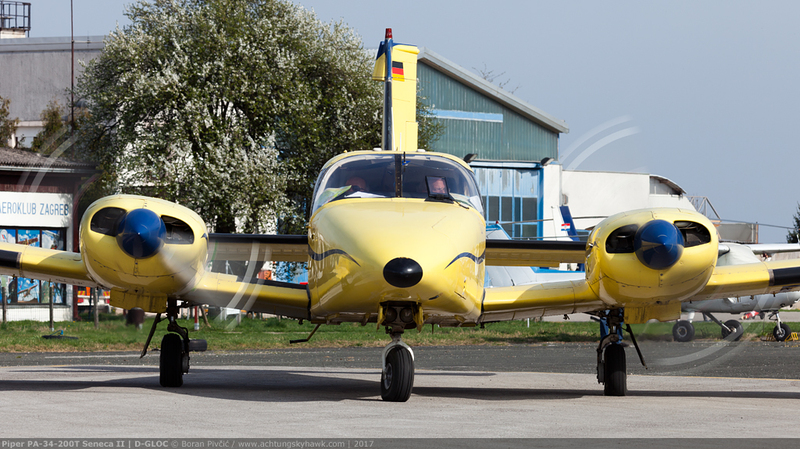 … and a dog to pack all of Lučko’s active gliders into its compact WW2-era hangar. 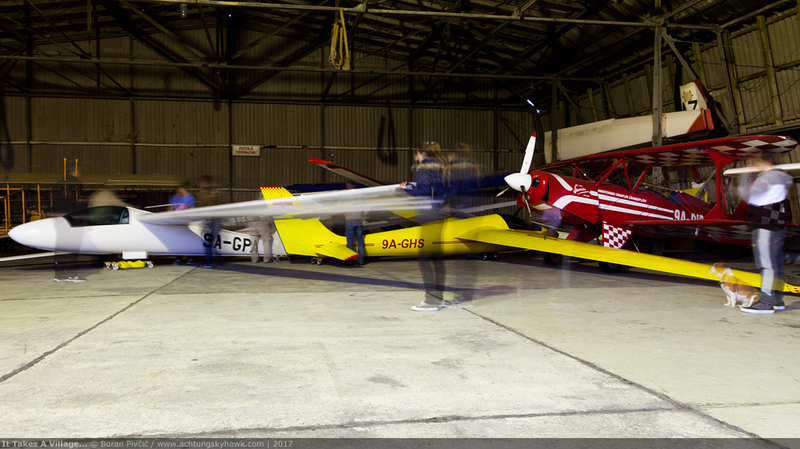 A scene well known to many pilots as instructors and students clean up at the end of a busy flying day. 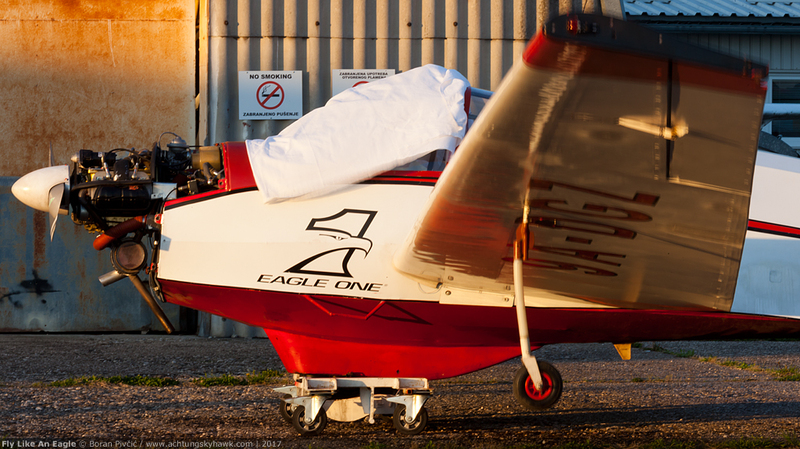 Young Eagle and Flying Teddy Bear await their turn to be tucked into the hangar after another full day of soaring and towing. Though still far from Lučko’s “golden years” of the early 2000s, this weekend saw five gliders pretty much constantly in the air – a very welcome slight after the airfield’s nearly decade-long financial crisis-induced slump in operations. Only the second 340 I’ve ever seen in the metal, D-INGI easily dominates the room during a spot of maintenance. One of Cessna’s “more serious” piston twins, the 340 boasts a pressurized cabin, pneumatic de-icing system and a 30,000 ft ceiling – all of which (especially when used together) require a significant supply of compressed air. To cater for these services, each of the type’s Continental TSIO-520s sports a whopping large turbocharger – seen just aft of the engine block – whose output is used to feed the engine itself, provide a 10,000 ft cabin altitude at the type’s typical 20,000 ft cruise, and inflate the wing and tail boots enough to break off any reasonable amount of ice. 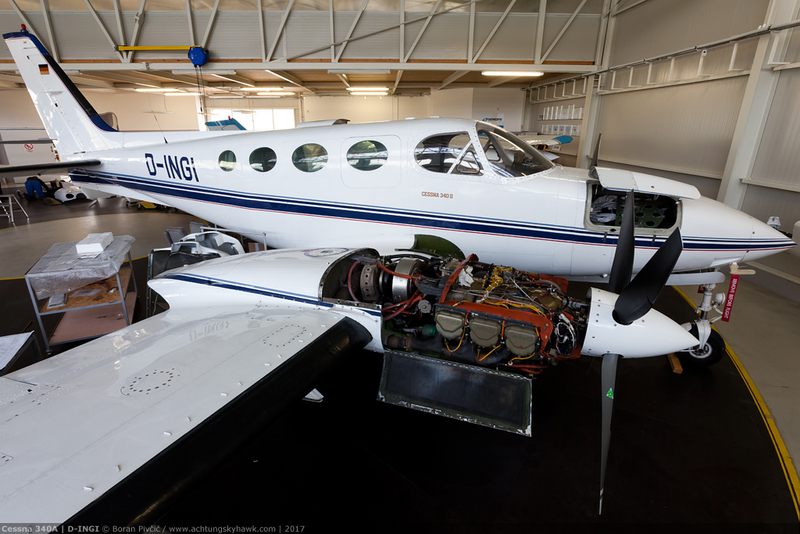 Like the similarly-equipped Beech 60 Duke and Piper PA-31P Pressurized Navajo, all of this however makes the 340 somewhat expensive to operate, making it slowly lose favor to the far simpler modern single-engine turboprop. Another interesting detail are the vortex generators, located just aft of the wing boots; most often seen on utility and short-field aircraft, their function is simply to create a swirling, turbulent layer of air along the upper surface of the wing. While this sounds counter-intuitive at first (and indeed does create a fair bit of additional drag), a high-energy turbulent boundary layer sticks to the wing for more of its width, increasing the lift generated at any one speed. This is most useful for operations at higher angles of attack (such as during approach and landing), since it both lowers the aircraft’s minimum speeds – and increases the effectiveness of the flaps and ailerons, providing for better control at low speed and more benign behavior in and near the stall. Fortune favors the brave – or at least those willing to stand out in the wind and rain for a photo! And a nice subject to do so for it is – likely the rarest of all the King Airs, the elusive B100. 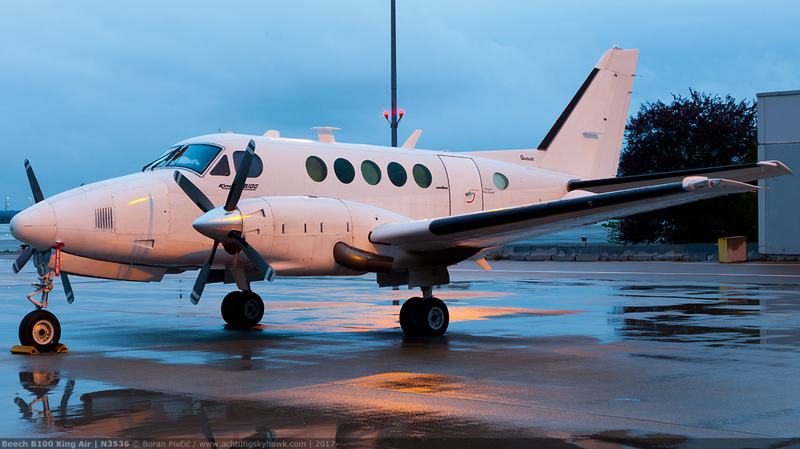 One the one hand, it’s a 100 series, a nowadays uncommon stretch of the base 90 – and on the other it’s the B model, the only series-production King Air not to use Pratt & Whitney Canada PT6A-series engines, but the rival 715 HP AI Research/Garrett TPE331-6. The latter engine’s “straight flow” layout – in which the exhaust ducts are the the back of the engine – is pretty much the only visual clue that sets it apart from the PT6A versions, whose “reverse flow” setup means the exhausts are located up at the front. Unfortunately, due to the now-reduced commonality with the rest of the family (and a general lack of demand for a TPE-powered version), only 137 B100s would be made, with the 1979 vintage N3536 – snapped here at Munich Airport (MUC/EDDM) – being a crisp mid-production example. 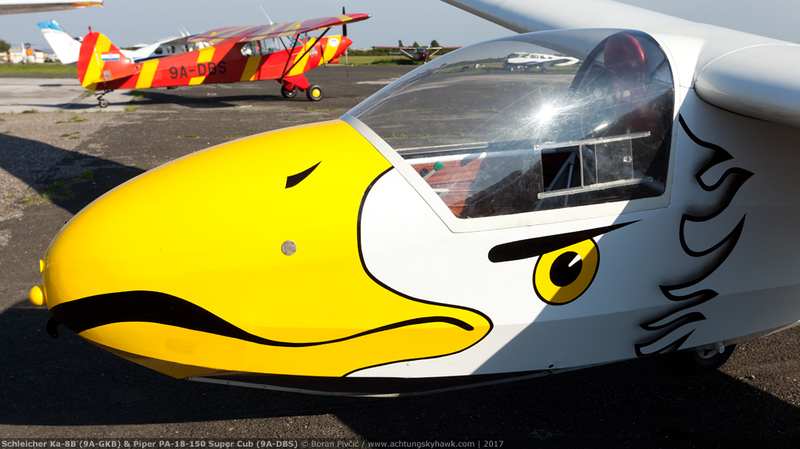 Pingback: Photo File – Summer Snappin’ | Achtung, Skyhawk!